You’ve asked them once, you’ve asked them a second time and yet the behaviour still keeps happening. How to address behaviour that persists despite your feedback about it. 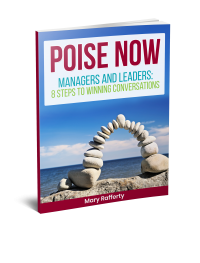 Today I want to talk to you about a question that came up yesterday in a seminar I was delivering to a team of managers on the theme of dealing with conflict on the team. The question was about dealing with repeated instances of behaviour that have occurred, despite getting feedback about this. The situation relates to a manager who has a person on her team, who has a tendency to get into a rage or an angry outburst. It doesn’t happen very often, but when it does, it tends to have a lot of fall out for other members of the team e.g the person on the receiving end of that particular outburst. People find it very difficult, very undermining, and so she wanted to do address this. The manager has already talked to this team member in the past when there was an incidence of this reaction and given her feedback about it. They would have a conversation and then things were usually fine again for the next period and then it would happen again. These outbursts have started to happen more recently in the past 12 months so a new year ahead, she wanted to sit down and have a conversation about putting a plan in place so that this kind of behaviour would no longer be happening. So here are three things I said that she might think about in planning and having this conversation. When you have a situation where there is a behaviour that despite being addressed continues to happen again and again, it’s time to reach for the CPR approach. CPR is an acronym coined by the authors of the **‘Crucial Conversations’ and ‘Crucial Accountability’ series of books and the ‘C’ stands for Content. So the first time something happens, e.g. in this particular situation, the staff member gets angry or has an outburst, you address the situation, provide feedback that focuses on that interaction or event, what happened, what was said. If a situation starts to happen again and again, it’s time now to move onto the ‘P’ in CPR which stands for Pattern. Now you are talking to the person about a pattern of behavior that has started to emerge and you are no longer focusing on one instance. You’re now talking about the fact that there are repeated instances of this particular behaviour and the repeated the impact that this is having on whoever’s involved. This is the approach that I suggested the manager take in the conversation she was about to have with the staff member in the case above. The ‘R’ in CPR stands for ‘Relationship’ and this is where we are no longer looking at the content, we’re no longer even talking about the pattern. You’re now actually seeing that you have a concern about that person’s ability or willingness to commit to that aspect of the work or behaviour. This results in you having to constantly harangue and nag them about it is having an impact on the working relationship and the trust you have in that person. The second point I made was that in this conversation it’s quite likely that the staff member might get into defending, disagreeing with what did and didn’t happen, who said what and when etc. It can be easy to get drawn into a kind of ‘he-said-she-said’ argument about individual instances. It caring, concerned, but also, there’s a firm, red line there that you are setting around behaviours – ‘this can no longer happen’. In summary then, first of all, when a situation starts to happen again and again talking about the pattern rather than to keep re-addressing each particular situation on its merits. Secondly that you don’t get drawn back into the argument over details of when, what happened, who did what etc. Instead, keep focused on what we’re trying to change, i.e. the pattern, into the future. Thirdly that the conversation has a caring and kind supportive tone which also sets a really clear boundary around what sort of behaviors are acceptable or what sort of behaviors are going to promote a positive atmosphere in the team and what sort of behaviors are just not helpful at all. If you have a situation you’d like some help with, please drop me an email, mary@consensmediation.ie check out our facebook page @consensusmediationcoaching and you can message me from there. Please like our facebook page. Thanks for watching.